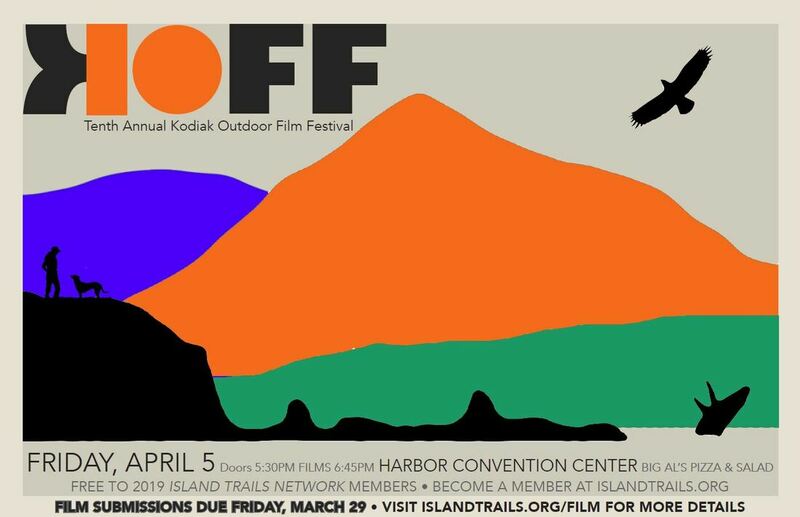 The Kodiak Outdoor Film Festival serves as our annual membership meeting and is an opportunity for many of our members to meet and greet the ITN board and staff. The films highlight outdoor activities in and around Kodiak ranging from surfing to snowboarding, from hunting to spearfishing. Dinner is free with a current year membership, and the Best Western Kodiak Inn provides a no-host bar. The 2017 festival featured 16 films ranging from 90 seconds to 10 minutes in length, with topics ranging from a trail run to a buffalo hunt. Top honors went to Lisa Hupp for Favorite Experience which played to a cheering, sold out crowd. The event raised about $7000 in memberships and silent auction proceeds for ITN. Download our submission guidelines to the 10th Annual KOFF to be held April 5, 2019 or contact ITN for more information. Admission to the festival is free to members who have joined or renewed in calendar year 2019. Join here. 1. All films and written descriptions must be submitted to Philip Tschersich by 5:00 pm March 29 2019. 2. Films may be fiction, non-fiction, or documentary, and should incorporate themes of "outdoors" or "adventure". The films must be local, meaning they must either be acted and shot principally in the Kodiak archipelago, or areas such as Katmai N.P. or outlying waters. 3. Although unrated, films should not exceed criteria of a "PG-13" rating by the MPAA. Offensive and/or abusive material will not be selected. 4. All actors, musicians/record labels, cast and crew should be credited in the film. 5. Submissions should be in a .mov (Quicktime movie) or .mp4 (MPEG-4 aka H.264) video file format on an external hard drive or thumb drive. Formatted DVDs will not be accepted. 6. Film selections will be announced by April 1, 2019 for subsequent screening at ITN's Kodiak Outdoor Film Festival on April 5, 2019. In rare cases, last-minute edits may be required so please remain available during the last week before the festival. 1. You may include a narrative if 1-2 paragraphs to place the film in context for the film selection committee, and to assist us in introducing the film. 2. Premier films will be considered more favorably than films which have previously been viewed by the public and/or published to the web, but you may wish to publish with password protection or hide from searches in order to share with ITN committee or others for feedback. This is encouraged. 3. Both video and audio quality may impact film selection. Video should be at least 720pHD (1280x720), 960p HD (1280x960), or 1080p HD (1920x1080) are even better. The data rates saved at should be at least 5,000 kbits/sec (medium quality), though up to 10,000 kbits/sec (high quality) is even better. 4. We are aiming for diversity of sport. Outdoor activities that are less frequently filmed will be looked upon favorably. 5. We strongly encourage character development, elements of plot or documentary devices (interviews, voice-overs, etc) to capture and hold audience attention. Films with imagery and music alone are sometimes appropriate, but should be kept short (3 minutes or less) as they will not hold audience attention. Any films may be conditionally selected pending the re-submission of a shorter edit, in which case entrants may have as little as 4 days to submit the revision. By request, a select subcommittee of the selection committee will provide an initial review prior to the submission deadline and provide feedback and suggestions. 7. Use subtitles when sound quality is sub-standard or to compensate for wind noise. Because of the layout of the convention center, please place these at the top of the screen rather than at bottom. 8. For technical assistance with the submissions process, contact ITN with technical questions WELL BEFORE the submission deadline.